The Tides resort in Riviera Maya was listed as the #1 in Mexico by Conde Nast Travelers in 2008 and out of the top 100 hotels in the World for 2009, Tides Resort ranked #41. That is incredible!!! This is one hotel that has it all and you won't be disappointed in any way. This is your place to relax in luxury. Where is this Caribbean resort located? 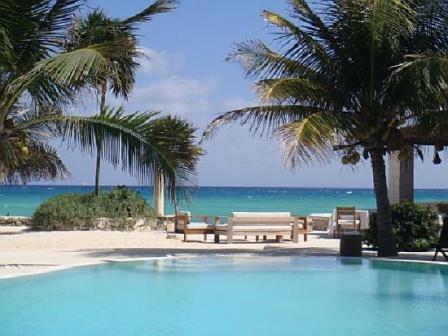 The Tides Riviera Maya is located 3 miles north of Playa del Carmen on the Yucatan Peninsula. This beach hotel has 6 acres of waterfront property. The Tide resort is an adult hotel, hidden away in a small village with a seaside escape into paradise. Part of the resort is actually tropical forest and jungle. Which makes for an unparalleled experience! 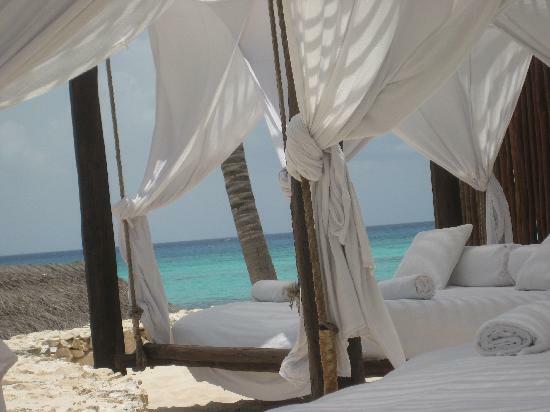 The beach at this boutique, luxury resort is on 7 miles of gorgeous white sand. 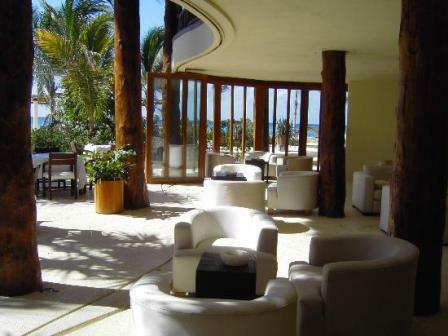 A 350 foot section is kept perfectly manicured and has palapa roofed cabanas. 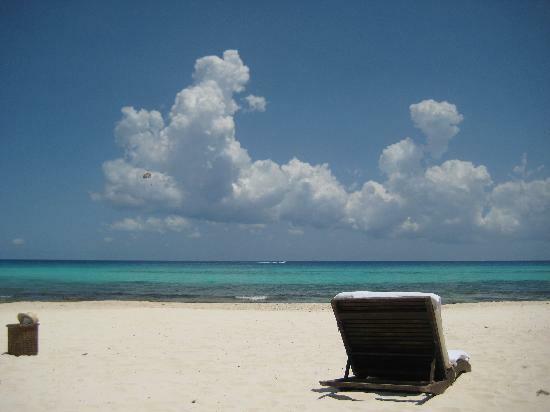 The beach here on the Riviera Maya is perfect for sunbathing and snorkeling. Here are a few pics of the beach here. What kind of accomodations does the Tides Resort have? 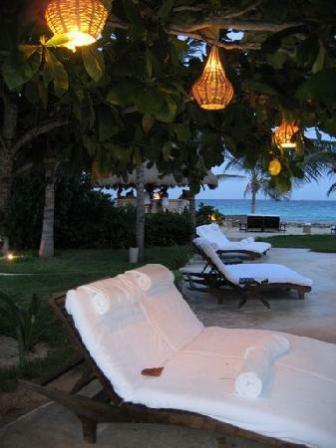 This Riviera Maya eco-conscious, luxury boutique hotel has 30 unbelievable villas. Upon your arrival, you will be greeted with a bottle of wine, exotic fruit platter, beach items (straw hat and silk head band). 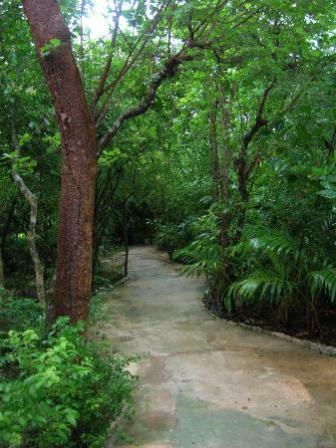 After receiving your villa number, you will be led through a tropical jungle path to your breathtaking villa. The villa that awaits you is palapa roofed and it's decor is classy and simple with mahogany doors and windows and canopy beds. All villas have large doors that slide open to your private patio with private plunge pool, hammock, marble table and chairs and oversized chaise lounge for two, lots of oversized towels, canopied bed, outdoor moon shower and 500 thread count sheets. Each villa also includes a TV, DVD player, cable TV, safe and complimentary wifi. Beachside accomodations include the private villas and the Tides Suite. There are 17 Luxury Villas with private plunge pools surrounding the jungle gardens. The pools are 12-14 feet long and 5 feet deep. 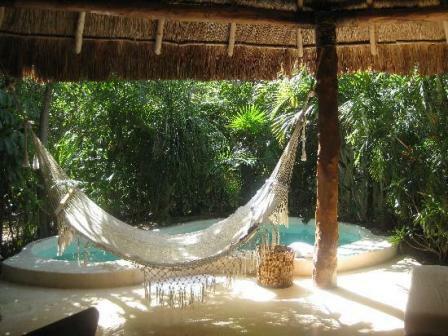 This picture shows the private plunge pool, hammock and more on your private patio. 12 Royal Villas are the same as luxury villas but have additional amenities including, VIP services, private pools lit with votive candles and flower petals and an Ipod docking station. These villas have the exclusive Mayordomo service which is butlers that will assist you prior to and during your stay. They will arrange reservations for the spa, dining and activities. The Tides Suite is a two story villa in the lush vegetation with lots of natural rattan and your own private hideaway. The first floor has a living area with bathroom including an onyx fountain faucet. A private patio with hammock, chaise lounges, and of course the private plunge pool. A spiral staircase leads you to the master suite with a king size canopy bed. 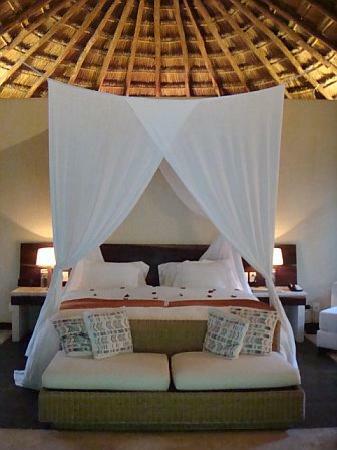 The bedroom opens up to a second story balcony with a round chaise for enjoy, hammock and marble table with chairs. Your Tides suite room amenities also include an entertainment center, dvd player, cd player with cd's, cable tv, books, hair dryer, snorkels, safe, complimentary wifi and Ipod accessories. The Tides resort has an outdoor pool with sundeck, poolside bar, Spa, Bar/Lounge, Hair salon, Dry cleaning service, self parking, complimentary newspapers and convienent currency exchange. The Spa is an indoor/outdoor setting. 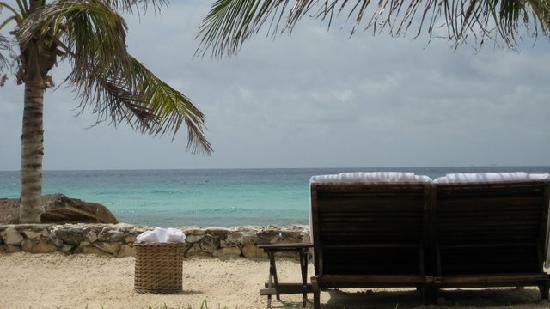 It offers services such as massage, herbal and mud treatments, temazcal baths(hot lava rock steam shower) and facials. The full service Spa offers daily Yoga classes in their seaside studio. The Tides resort has a Fertility Ritual House that is part of the spa, where you can enjoy a full body massage with seeds, honey and flowers in a rustic wood cabin while partaking in a Mayan tradition. After the massage you will lie in a tub carved from a tree trunk immersed in a bath of seeds. Sounds amazing doesn't it! There is a tropical butler who comes by to offer iced face towels while your taking in the sun at the pool. Here is the cabana you will be lying in while waiting for your tropical butler. The concierge service has a multilingual staff, wedding coordinator and are available for anything you may need. They can also assist with any nearby activities you would like to enjoy such as fishing, wind surfing, cycling, parasailing, boating, horseback riding, golfing and scuba diving. This five star luxury boutique hotel offers luxury transportation to and from the airport. You can arrange rental of cars such as Mercedes Benz, Hummer H2, Porsche Boxter or Rolls Royce 1959. If you really want to go all out, The Tides also has a helicopter service that can take you to excusions and the airport. 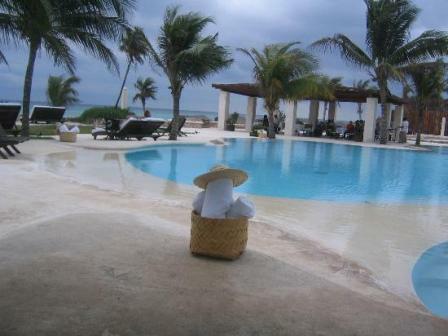 I haven't seen this luxuries at any other Riviera Maya hotel or resort. This pathway is one of the ways that lead to these hideaways. There are three magical hideaways at this five star luxury Riviera Maya resort that are worth checking out and taking a while to relax or dream at. First is a corner of the resort that has two natural caverns and a cascading waterfall. The second is a corner in the jungle with rustic yet comfortable furniture. The third is a corner shaded by trees with inviting chaises and benches. These magical and unforgetable spaces will cause you to dream and enhance your creativity. Is there a restaurant at The Tide Resort? Yes, there is a restaurant and bar called La Marea. It is a ,em>oceanside gourmet restaurant and cocktail lounge. The food features Mexican and Maya cuisines along with some international influences making it quite a unique and delicious experience. With daily specials, fresh seafood, cevocje menu and grilled snacks you will not be disappointed. La Marea has a wine cellar with 500 bottles of wine so you will have a great selection to choose from. La Marea is open for breakfast, lunch and dinner. Here is the outdoor portion of the lounge. Room service is also available from 7am to 11pm. This is not an all inclusive hotel. The Tides Riviera Maya has the philosophy "dine anywhere, anytime policy". So they will accomodate your poolside, beachside, anyside needs. Wanting to head out to Playa del Carmen for some shopping? Well there is a complimentary shuttle service from the hotel leaving each day at 4pm and returning at 6:30pm for your convenience. Thinking of getting married at The Tides Resort? The perfect oceanside courtyard can accomodate for your ceremony of up to 150 guests and premier gourmet catering that you will be pleased with. This is definitly a 5 star boutique, luxury resort that you will be more than pleased with!